The Moxie 37 Island Hopper, designed and built in South Africa by Uwe Jaspersen, was one of the boats that surprised me at the Annapolis Boat Show. It’s a fast looking cruising catamaran with large open bridge deck that’s covered by a curved roof. 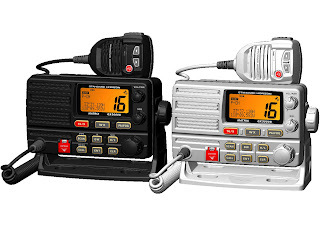 The helm station (and all sail controls) are at the base of the mast (a la Gunboat cats) but the Moxie is not affiliated with Gunboat in any way. 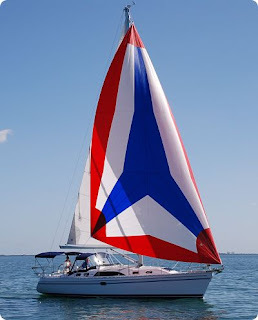 It’s light overall weight (aprox 7,000 pounds), powerful square topped fully battened main set on a rotating wing mast and several options for large reaching sail combinations make it easy for the Moxie to reel off speeds in low teens. 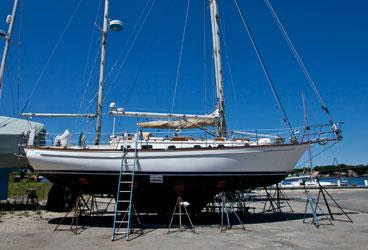 It’s got curved daggarboards that are designed to provide some lift as well as simply to free up more accommodations room down below—the curve follows the curve of each hull. And even though much of the living space is confined to the hulls, the clever accommodations plan provides plenty of well lit, well ventilated cabin space. It’s appropriately called the “Island Hopper.” The first boat was designed specifically for an owner to cruise the Seychelles (almost on the equator off East Africa). The large bridge deck combines the benefit of a rigid roof to keep the sun and the rain out with wide openness. There’s lots of room to lounge and this is where you’d want to be in any tropical locale. It’s not like the boat couldn’t accommodate an enclosed bridge deck saloon—Jaspersen simply and rightly optimized the open on deck space for warm water cruising (and kept lots of speed steeling weight out of the boat as well). That said, the cockpit forward design should also be comfortable in colder climes or on long passages thanks to the ability to enclose both the helm area and the entire bridge deck area with canvas and vinyl windows. Sign me up for double digit speed runs in-between tropical anchorages. That is one crazy machine. The unusual boats are the best.